Nerve agents, sometimes also called nerve gases, are a class of organic chemicals that disrupt the mechanisms by which nerves transfer messages to organs. The disruption is caused by the blocking of acetylcholinesterase, an enzyme that catalyzes the breakdown of acetylcholine, a neurotransmitter. Poisoning by a nerve agent leads to constriction of pupils, profuse salivation, convulsions, and involuntary urination and defecation, with the first symptoms appearing in seconds after exposure. Death by asphyxiation or cardiac arrest may follow in minutes due to the loss of the body's control over respiratory and other muscles. Some nerve agents are readily vaporized or aerosolized, and the primary portal of entry into the body is the respiratory system. Nerve agents can also be absorbed through the skin, requiring that those likely to be subjected to such agents wear a full body suit in addition to a respirator. Nerve agents are generally colorless to amber-colored, tasteless liquids that may evaporate to a gas. Agents sarin and VX are odorless; tabun has a slightly fruity odor and soman has a slight camphor odor. Nerve agents attack the nervous system. All such agents function the same way resulting in cholinergic crisis: they inhibit the enzyme acetylcholinesterase, which is responsible for the breakdown of acetylcholine (ACh) in the synapses between nerves that control muscle contraction. If the agent cannot be broken down, muscles are prevented from relaxing and they are effectively paralyzed. :131–139 This includes the heart and the muscles used for breathing. Because of this, the first symptoms usually appear within seconds of exposure and death can occur via asphyxiation or cardiac arrest in a few minutes. The effects of nerve agents are long lasting and increase with continued exposure. Survivors of nerve agent poisoning almost invariably suffer chronic neurological damage and related psychiatric effects. Possible effects that can last at least up to 2–3 years after exposure include blurred vision, tiredness, declined memory, hoarse voice, palpitations, sleeplessness, shoulder stiffness and eye strain. In people exposed to nerve agents, serum and erythrocyte acetylcholinesterase in the long-term are noticeably lower than normal and tend to be lower the worse the persisting symptoms are. Nerve agents disrupt the nervous system by inhibiting the function of the enzyme acetylcholinesterase by forming a covalent bond with its active site, where acetylcholine would normally be broken down (undergo hydrolysis). Acetylcholine thus builds up and continues to act so that any nerve impulses are continually transmitted and muscle contractions do not stop. This same action also occurs at the gland and organ levels, resulting in uncontrolled drooling, tearing of the eyes (lacrimation) and excess production of mucus from the nose (rhinorrhea). The reaction product of the most important nerve agents, including soman, sarin, tabun and VX, with acetylcholinesterase were solved by the U.S. Army using X-ray crystallography in the 1990s. The reaction products have been confirmed subsequently using different sources of acetylcholinesterase and the closely related target enzyme, butyrylcholinesterase. The X-ray structures clarify important aspects of the reaction mechanism (e.g., stereochemical inversion) at atomic resolution and provide a key tool for antidote development. Atropine and related anticholinergic drugs act as antidotes to nerve agent poisoning because they block acetylcholine receptors, but they are poisonous in their own right. 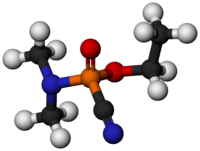 Some synthetic anticholinergics, such as biperiden, may counteract the central symptoms of nerve agent poisoning better than atropine, since they pass the blood–brain barrier better than atropine. While these drugs will save the life of a person affected by nerve agents, that person may be incapacitated briefly or for an extended period, depending on the extent of exposure. The endpoint of atropine administration is the clearing of bronchial secretions. Atropine for field use by military personnel is often loaded in an autoinjector (e.g. ATNAA), for ease of use in stressful conditions. Pralidoxime chloride, also known as 2-PAM chloride, is also used as an antidote. Rather than counteracting the initial effects of the nerve agent on the nervous system as does atropine, pralidoxime chloride reactivates the poisoned enzyme (acetylcholinesterase) by scavenging the phosphoryl group attached on the functional hydroxyl group of the enzyme. Though safer to use than atropine, it takes longer to act. Revival of acetylcholinesterase with pralidoxime chloride works more effectively on nicotinic receptors while blocking acetylcholine receptors with atropine is more effective on muscarinic receptors. Often, severe cases of poisoning are treated with both drugs. Butyrylcholinesterase is under development by the U.S. Department of Defense as a prophylactic countermeasure against organophosphate nerve agents. It binds nerve agent in the bloodstream before the poison can exert effects in the nervous system. Both purified acetylcholinesterase and butyrylcholinesterase have demonstrated success in animal studies as "biological scavengers" (and universal targets) to provide stoichiometric protection against the entire spectrum of organophosphate nerve agents. Butyrylcholinesterase currently is the preferred enzyme for development as a pharmaceutical drug primarily because it is a naturally circulating human plasma protein (superior pharmacokinetics) and its larger active site compared with acetylcholinesterase may permit greater flexibility for future design and improvement of butyrylcholinesterase to act as a nerve agent scavenger. Chemical form of the nerve agent tabun, the first ever synthesized. The G series of nerve agents. The G-series is thus named because German scientists first synthesized them. G series agents are known as non-persistent, while the V series are persistent. All of the compounds in this class were discovered and synthesized during or prior to World War II, led by Gerhard Schrader (later under the employment of IG Farben). This series is the first and oldest family of nerve agents. The first nerve agent ever synthesised was GA (tabun) in 1936. GB (sarin) was discovered next in 1939, followed by GD (soman) in 1944, and finally the more obscure GF (cyclosarin) in 1949. GB was the only G agent that was fielded by the US as a munition, in rockets, aerial bombs, and artillery shells. Chemical form of the nerve agent VX. The V series of nerve agents. The V-series is the second family of nerve agents and contains five well known members: VE, VG, VM, VR, and VX, along with several more obscure analogues. The most studied agent in this family, VX, was invented in the 1950s at Porton Down in the United Kingdom. Ranajit Ghosh, a chemist at the Plant Protection Laboratories of Imperial Chemical Industries (ICI) was investigating a class of organophosphate compounds (organophosphate esters of substituted aminoethanethiols). Like Schrader, Ghosh found that they were quite effective pesticides. In 1954, ICI put one of them on the market under the trade name Amiton. It was subsequently withdrawn, as it was too toxic for safe use. The toxicity did not go unnoticed and some of the more toxic materials had been sent to the British Armed Forces research facility at Porton Down for evaluation. After the evaluation was complete, several members of this class of compounds became a new group of nerve agents, the V agents (depending on the source, the V stands for Victory, Venomous, or Viscous). The best known of these is probably VX, with VR ("Russian V-gas") coming a close second (Amiton is largely forgotten as VG). All of the V-agents are persistent agents, meaning that these agents do not degrade or wash away easily and can therefore remain on clothes and other surfaces for long periods. In use, this allows the V-agents to be used to blanket terrain to guide or curtail the movement of enemy ground forces. The consistency of these agents is similar to oil; as a result, the contact hazard for V-agents is primarily – but not exclusively – dermal. VX was the only V-series agent that was fielded by the US as a munition, in rockets, artillery shells, airplane spray tanks, and landmines. The Novichok (Russian: Новичо́к, "newcomer") agents, a series of organophosphate compounds, were developed in the Soviet Union and in Russia from the mid-1960s to the 1990s. The Novichok program aimed to develop and manufacture highly deadly chemical weapons that were unknown to the West. The new agents were designed to be undetectable by standard NATO chemical-detection equipment and to defeat chemical-protective gear. In addition to the newly-developed "third generation" weapons, binary versions of several Soviet agents were developed and were designated as "Novichok" agents. Contrary to what is sometimes claimed, not all nerve agents are organophosphates. A large group of them are carbamates like EA-3990 and EA-4056, both of which have been claimed to be about 3 times more toxic than VX. Both the USA and the Soviet Union developed carbamate nerve agents during the Cold War. They are sometimes grouped as "fourth generation" agents along with the Novichok agents due to their falling outside the definitions of controlled substances under the CWC. Some insecticides, including carbamates and organophosphates such as dichlorvos, malathion and parathion, are nerve agents. The metabolism of insects is sufficiently different from mammals that these compounds have little effect on humans and other mammals at proper doses, but there is considerable concern about the effects of long-term exposure to these chemicals by farm workers and animals alike. At high enough doses, acute toxicity and death can occur through the same mechanism as other nerve agents. Some insecticides such as demeton, dimefox and paraoxon are sufficiently toxic to humans that they have been withdrawn from agricultural use, and were at one stage investigated for potential military applications. Paraoxon was allegedly used as an assassination weapon by the apartheid South African government as part of Project Coast. Organophosphate pesticide poisoning is a major cause of disability in many developing countries and is often the preferred method of suicide. The method chosen will depend on the physical properties of the nerve agent(s) used, the nature of the target, and the achievable level of sophistication. Sarin was discovered by Schrader and his team in 1938 and named in honor of its discoverers: Schrader, Ambros, Gerhard Ritter, and von der Linde. It was codenamed T-144 or Trilon-46. It was found to be more than ten times as potent as tabun. Soman was discovered by Richard Kuhn in 1944 as he worked with the existing compounds; the name is derived from either the Greek 'to sleep' or the Latin 'to bludgeon'. It was codenamed T-300. Cyclosarin was also discovered during WWII but the details were lost and it was 'discovered' again in 1949. The G-series naming system was created by the United States when it uncovered the German activities, labeling tabun as GA (German Agent A), sarin as GB and soman as GD. Ethyl sarin was tagged GE and cyclosarin as GF. In 1939, a pilot plant for tabun production was set up at Munster-Lager, on Lüneburg Heath near the German Army proving grounds at Raubkammer [de]. In January 1940, construction began on a secret plant, code named "Hochwerk" (High factory), for the production of tabun at Dyhernfurth an der Oder (now Brzeg Dolny in Poland), on the Oder River 40 km (25 mi) from Breslau (now Wrocław) in Silesia. The plant was large, covering an area of 2.4 by 0.8 km (1.49 by 0.50 mi) and was completely self-contained, synthesizing all intermediates as well as the final product, tabun. The factory even had an underground plant for filling munitions, which were then stored at Krappitz (now Krapkowice) in Upper Silesia. The plant was operated by Anorgana GmbH [de], a subsidiary of IG Farben, as were all other chemical weapon agent production plants in Germany at the time. The plant produced between 10 000 and 30 000 tons of tabun before its capture by the Soviet Army and moved, probably to Dzerzhinsk, USSR. Speer, who was strongly opposed to the introduction of tabun, flew Otto Ambros, I.G. 's authority on poison gas as well as synthetic rubber, to the meeting. Hitler asked Ambros, "What is the other side doing about poison gas?" Ambros explained that the enemy, because of its greater access to ethylene, probably had a greater capacity to produce mustard gas than Germany did. Hitler interrupted to explain that he was not referring to traditional poison gases: "I understand that the countries with petroleum are in a position to make more [mustard gas], but Germany has a special gas, tabun. In this we have a monopoly in Germany." He specifically wanted to know whether the enemy had access to such a gas and what it was doing in this area. To Hitler's disappointment Ambros replied, "I have justified reasons to assume that tabun, too, is known abroad. I know that tabun was publicized as early as 1902, that Sarin was patented and that these substances appeared in patents. " (...)Ambros was informing Hitler of an extraordinary fact about one of Germany's most secret weapons. The essential nature of tabun and sarin had already been disclosed in the technical journals as far back as 1902 and I.G. had patented both products in 1937 and 1938. Ambros then warned Hitler that if Germany used tabun, it must face the possibility that the Allies could produce this gas in much larger quantities. Upon receiving this discouraging report, Hitler abruptly left the meeting. The nerve gases would not be used, for the time being at least, although they would continue to be produced and tested. Since World War II, Iraq's use of mustard gas against Iranian troops and Kurds (Iran–Iraq War of 1980–1988) has been the only large-scale use of any chemical weapons. On the scale of the single Kurdish village of Halabja within its own territory, Iraqi forces did expose the populace to some kind of chemical weapons, possibly mustard gas and most likely nerve agents. Operatives of the Aum Shinrikyo religious group made and used Sarin several times on other Japanese, most notably the Tokyo subway sarin attack. In the Gulf War, no nerve agents (nor other chemical weapons) were used, but a number of U.S. and UK personnel were exposed to them when the Khamisiyah chemical depot was destroyed. This and the widespread use of anticholinergic drugs as a protective treatment against any possible nerve gas attack have been proposed as a possible cause of Gulf War syndrome. Sarin gas was deployed in a 2013 attack on Ghouta during the Syrian Civil War, killing several hundred people. Most governments contend that forces loyal to President Bashar al-Assad deployed the gas; however, the Syrian Government has denied responsibility. On 13 February 2017, the nerve agent VX was used in the assassination of Kim Jong-nam, half-brother of the North Korean leader Kim Jong-un, at Kuala Lumpur International Airport in Malaysia. On 4 March 2018, a former Russian agent (who was convicted of high treason but allowed to live in the United Kingdom via a spy swap agreement), Sergei Skripal and his daughter who were visiting from Moscow were both poisoned by a nerve agent. They survived and were subsequently released from the hospital. In addition, a Wiltshire Police officer, Nick Bailey, was exposed to the substance. He was one of the first to respond to the incident. Twenty-one members of the public received medical treatment following exposure to the nerve agent. Despite this, only Bailey and the Skripals remained in critical conditions. On 11 March 2018, Public Health England issued advice for the other people believed to have been in The Mill Pub (location where the attack is believed to have been carried out) or the nearby Zizzi Restaurant. On 12 March 2018, British Prime Minister Theresa May stated that the substance used was a Novichok nerve agent. In 1972, the United States Congress banned the practice of disposing chemical weapons into the ocean. 32 000 tons of nerve and mustard agents had already been dumped into the ocean waters off the United States by the U.S. Army, primarily as part of Operation CHASE. According to a 1998 report by William Brankowitz, a deputy project manager in the U.S. Army Chemical Materials Agency, the Army created at least 26 chemical weapons dump sites in the ocean off at least 11 states on both the west and east coasts. Due to poor records, they currently only know the rough whereabouts of half of them. There is currently a lack of scientific data regarding the ecological and health effects of this dumping. In the event of leakage, many nerve agents are soluble in water and would dissolve in a few days, while other substances like sulfur mustard could last longer. There have also been a few incidents of chemical weapons washing ashore or being accidentally retrieved, for example during dredging or trawl fishing operations. The methods of detecting gaseous nerve agents include but are not limited to the following. Laser photoacoustic spectroscopy (LPAS) is a method that has been used to detect nerve agents in the air. In this method, laser light is absorbed by gaseous matter. This causes a heating/cooling cycle and changes in pressure. Sensitive microphones convey sound waves that result from the pressure changes. Scientists at the U.S. Army Research Laboratory engineered an LPAS system that can detect multiple trace amounts of toxic gases in one air sample. This technology contained three lasers modulated to different frequency, each producing a different sound wave tone. The different wavelengths of light were directed into a sensor referred to as the photoacoustic cell. Within the cell were the vapors of different nerve agents. The traces of each nerve agent had a signature effect on the “loudness” of the lasers’ sound wave tones. Some overlap of nerve agents’ effects did occur in the acoustic results. However, it was predicted that specificity would increase as additional lasers with unique wavelengths were added. Yet, too many lasers set to different wavelengths could result in overlap of absorption spectra. Citation LPAS technology can identify gases in parts per billion (ppb) concentrations. Non-dispersive infrared techniques have been reported to be used for gaseous nerve agent detection. Traditional IR absorption has been reported to detect gaseous nerve agents. Fourier transform infrared (FTIR) spectroscopy has been reported to detect gaseous nerve agents. ^ a b "Medical Management Guidelines (MMGs): Nerve Agents (GA, GB, GD, VX)". Agency for Toxic Substances and Disease Registry (ATSDR). U.S. Department of Health and Human Services. Archived from the original on 2018-01-25. Retrieved 2018-03-08. ^ a b Sidell FR (1997). Medical aspects of chemical and biological warfare. Borden Institute, Walter Reed Army Medical Center. ISBN 978-9997320919. ^ "Chemical and Biological Agents". New Environment Inc. Archived from the original on 2017-05-01. Retrieved 2018-03-08. ^ "Effects of Blister Agents". Integrated Publishing, Inc. Archived from the original on 2017-04-08. Retrieved 2018-03-08. ^ Sidell FR (2008). "Soman and sarin: clinical manifestations and treatment of accidental poisoning by organophosphates". Clinical Toxicology. 7 (1): 1–17. doi:10.3109/15563657408987971. PMID 4838227. ^ Nishiwaki Y, Maekawa K, Ogawa Y, Asukai N, Minami M, Omae K (November 2001). "Effects of sarin on the nervous system in rescue team staff members and police officers 3 years after the Tokyo subway sarin attack". Environmental Health Perspectives. 109 (11): 1169–73. PMC 1240479. PMID 11713003. ^ Nakajima T, Ohta S, Fukushima Y, Yanagisawa N (November 1999). "Sequelae of sarin toxicity at one and three years after exposure in Matsumoto, Japan". Journal of Epidemiology. 9 (5): 337–43. doi:10.2188/jea.9.337. PMID 10616267. ^ Millard CB, Kryger G, Ordentlich A, Greenblatt HM, Harel M, Raves ML, Segall Y, Barak D, Shafferman A, Silman I, Sussman JL (June 1999). "Crystal structures of aged phosphonylated acetylcholinesterase: nerve agent reaction products at the atomic level". Biochemistry. 38 (22): 7032–9. doi:10.1021/bi982678l. PMID 10353814. ^ Millard CB, Koellner G, Ordentlich A, Shafferman A, Silman I, Sussman JL (1999). "Reaction Products of Acetylcholinesterase and VX Reveal a Mobile Histidine in the Catalytic Triad". Journal of the American Chemical Society. 121 (42): 9883–4. doi:10.1021/ja992704i. ^ a b c d "NERVE AGENTS". fas.org. 2018-03-08. Archived from the original on 2017-12-12. ^ Shih TM, McDonough JH (May 2000). "Efficacy of biperiden and atropine as anticonvulsant treatment for organophosphorus nerve agent intoxication". Archives of Toxicology. 74 (3): 165–72. PMID 10877003. ^ Shim, TM; McDonough JH (May 2000). "Efficacy of biperiden and atropine as anticonvulsant treatment for organophosphorus nerve agent intoxication". Archives of Toxicology. 74 (3): 165–172. doi:10.1007/s002040050670. PMID 10877003. ^ Eddleston M, Szinicz L, Eyer P, Buckley N (May 2002). "Oximes in acute organophosphorus pesticide poisoning: a systematic review of clinical trials". QJM. 95 (5): 275–83. PMC 1475922. PMID 11978898. ^ Lockridge O (April 2015). "Review of human butyrylcholinesterase structure, function, genetic variants, history of use in the clinic, and potential therapeutic uses". Pharmacology & Therapeutics. 148: 34–46. doi:10.1016/j.pharmthera.2014.11.011. PMID 25448037. ^ Ashani Y, Shapira S, Levy D, Wolfe AD, Doctor BP, Raveh L (January 1991). "Butyrylcholinesterase and acetylcholinesterase prophylaxis against soman poisoning in mice". Biochemical Pharmacology. 41 (1): 37–41. doi:10.1016/0006-2952(91)90008-S. PMID 1986743. ^ Doctor BP, Blick DW, Caranto G, Castro CA, Gentry MK, Larrison R, Maxwell DM, Murphy MR, Schutz M, Waibel K (June 1993). "Cholinesterases as scavengers for organophosphorus compounds: protection of primate performance against soman toxicity". Chemico-Biological Interactions. 87 (1–3): 285–93. doi:10.1016/0009-2797(93)90056-5. PMID 8343986. ^ Broomfield CA, Lockridge O, Millard CB (May 1999). "Protein engineering of a human enzyme that hydrolyzes V and G nerve agents: design, construction and characterization". Chemico-Biological Interactions. 119-120: 413–8. doi:10.1016/S0009-2797(99)00053-8. PMID 10421478. ^ Sidell FR, Newmark J, McDonough J. "Chapter 5: Nerve Agents" (PDF). Medical Aspects of Chemical Warfare. pp. 155–219. Archived from the original (PDF) on 13 February 2013. ^ a b Ellison DH (2008). Handbook of chemical and biological warfare agents (2nd ed.). Boca Raton: CRC Press. ISBN 978-0-8493-1434-6. OCLC 82473582. ^ Sample I (2018-03-13). "Novichok nerve agents – what are they?". the Guardian. Archived from the original on 2018-03-18. Retrieved 2018-03-19. ^ Hughes D, Rogers J (29 March 2018). "What is a nerve agent, what effects do they have and how rare was the one used in Russian ex-spy Sergei Skripal's poisoning?". The Sun. Archived from the original on 2018-03-19. Retrieved 2018-03-19. ^ Vásárhelyi G, Földi L (2007). "History of Russia's chemical weapons" (PDF). AARMS. 6 (1): 135–146. ^ Buckley NA, Roberts D, Eddleston M (November 2004). "Overcoming apathy in research on organophosphate poisoning". BMJ. 329 (7476): 1231–3. doi:10.1136/bmj.329.7476.1231. PMC 529372. PMID 15550429. ^ a b Ledgard JB (2006). A laboratory history of chemical warfare agents : a book. Mazal Holocaust Collection (2nd ed.). Jared Ledgard?]. ISBN 9780615136455. OCLC 171111408. ^ Richard J. Evans (2008). The Third Reich at War, 1939–1945. Penguin. p. 669. ISBN 978-1-59420-206-3. Retrieved January 13, 2013. ^ Harris R (2002). A higher form of killing : the secret history of chemical and biological warfare. Paxman, Jeremy, 1950-. New York: Random House Trade Paperbacks. ISBN 9780812966534. OCLC 49356080. ^ Ruffner KC (1995). Corona: America's first satellite program. [New York]: [Morgan James]. p. 185. ISBN 978-0-9758570-4-5. OCLC 772235331. ^ Suspect CW Agent Production Plants, Dzerzhinsk, USSR, Changes Since 1962. CIA/NPIC. 1963. ^ Borkin J (1978). The crime and punishment of I.G. Farben. Mazal Holocaust Collection. New York: Free Press. ISBN 978-0-02-904630-2. OCLC 3845685. ^ Kinsley S (11 March 1991). "Whatever Happened To The Iraqi Kurds?". Human Rights Watch in Iraq. Human Rights Watch. Archived from the original on 2008-12-13. Retrieved 20 July 2011. ^ Osaki T (30 April 2015). "Ex-Aum Shinrikyo member Katsuya Takahashi gets life in prison over 1995 sarin attack". Japan Times Online. Retrieved 24 March 2018. ^ Snow RL (2003). Deadly cults : the crimes of true believers. Westport, Conn: Praeger. ISBN 978-0-275-98052-8. OCLC 52602822. ^ Persian Gulf War Illnesses Task Force (April 9, 1997). "Khamisiyah: A Historical Perspective on Related Intelligence". Federation of American Scientists. Archived from the original on July 22, 2013. Retrieved March 29, 2015. ^ Sellström Å, Cairns S, Barbeschi M (16 September 2013). "Report of the United Nations Mission to Investigate Allegations of the Use of Chemical Weapons in the Syrian Arab Republic on the alleged use of chemical weapons in the Ghouta area of Damascus on 21 August 2013" (PDF). United Nations. Archived (PDF) from the original on 18 September 2013. Retrieved 27 April 2015. ^ Nauert H (March 6, 2018). "Imposition of Chemical and Biological Weapons Control and Warfare Elimination Act Sanctions on North Korea". United States Department of State. On February 22, 2018, the United States determined under the Chemical and Biological Weapons Control and Warfare Elimination Act of 1991 (CBW Act) that the Government of North Korea used the chemical warfare agent VX to assassinate Kim Jong Nam, in the Kuala Lumpur airport. ^ Morris, Steven; Wintour, Patrick (18 May 2018). "Sergei Skripal Discharged from Salisbury Hospital". The Guardian (UK). Retrieved 2018-05-18. ^ "Russia spy latest: Salisbury police officer exposed to nerve agent says he is 'not a hero' and was 'merely doing his job'". The Independent. ^ "Public health advice following Salisbury nerve agent incident". Gov.UK. 11 March 2018. ^ "Highly likely Russia behind spy attack – PM". BBC News. 2018-03-13. Retrieved 2018-03-13. ^ Brankowitz WR (27 April 1987). Chemical Weapons Movement History Compilation (PDF). Aberdeen Proving Ground, Maryland: Office of the Program Manager for Chemical Munitions. Archived from the original (PDF) on 2013-07-12. ^ Bearden DM (3 January 2007). "U.S. Disposal of Chemical Weapons in the Ocean: Background and Issues for Congress" (PDF). U.S. Congressional Research Service. Archived from the original (PDF) on 2017-12-12. Retrieved 28 March 2012. ^ a b c Gurton, Kristan P.; Felton, Melvin; Tober, Richard (2012-08-15). "Selective real-time detection of gaseous nerve agent simulants using multiwavelength photoacoustics". Optics Letters. 37 (16): 3474–3476. doi:10.1364/OL.37.003474. ISSN 1539-4794. ^ a b Meyer, Lyndsay (August 14, 2012). "Hearing the Telltale Sounds of Dangerous Chemicals: New Photoacoustic Technique Detects Multiple Nerve Agents Simultaneously". OSA The Optical Society. ^ a b c d e R. Prasad, Coorg; Lei, Jie; Shi, Wenhui; Li, Guangkun; Dunayevskiy, Ilya; Patel, Chandra (2012-05-01). "Laser Photoacoustic Sensor for Air Toxicity Measurements". Proceedings of SPIE. 8366: 7. doi:10.1117/12.919241. ^ "Army scientists demonstrate rapid detection of nerve agents | U.S. Army Research Laboratory". www.arl.army.mil. Retrieved 2018-09-13. ^ Schmitt, Katrin; Müller, Andreas; Huber, Jochen; Busch, Sebastian; Wöllenstein, J (2011-12-31). "Compact photoacoustic gas sensor based on broadband IR source". Procedia Engineering. 25: 1081–1084. doi:10.1016/j.proeng.2011.12.266. ^ Mukherjee, Anadi; Prasanna, Manu; Lane, Michael; Go, Rowel; Dunayevskiy, Ilya; Tsekoun, Alexei; Patel, C. Kumar N. (2008-09-20). "Optically multiplexed multi-gas detection using quantum cascade laser photoacoustic spectroscopy". Applied Optics. 47 (27): 4884–4887. doi:10.1364/AO.47.004884. ISSN 2155-3165.